SAN Airport Parking Your car can pay for your parking space. SAN Airport Parking : TravelCar is a company in the transport business that is keen on delivering top-notch car rental and ride-sharing services. In the U.S.A alone, the company has served travelers from major airports to surrounding cities. Due to an impressive performance in the industry, Trustpilot and other ranking firms have placed TravelCar top on the bar with a score over 9. The company delivers cost-effective parking solutions to its subscribers. San Diego International Airport (SAN) is located 4.8 kilometers from Downtown San Diego in the State of California, U.S.A.
SAN came into existence on 16th August 1928. 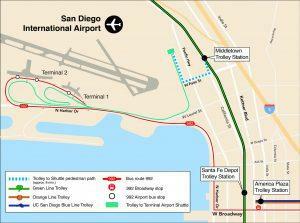 SAN is owned and managed by San Diego County Regional Airport Authority. The airport serves the larger San Diego region. It is a focus city for Southwest Airlines and Alaska Airlines. SAN operates international flights to Japan, Switzerland, United Kingdom, Canada, Mexico, and Germany. This airport hosts the largest USO center in the world. SAN is unique due to its busy single runway that requires steep landing because of its proximity to the Peninsular Ranges. It has been rated the most active and most difficult single runway in U.S.A and the world. Additionally, it comes third after Mumbai and London Gatwick in being the most active single runway in the world. SAN has an existing curfew for take-offs to minimize noise pollution. Therefore, take-offs are only permitted between 6:30 am and 11:30 pm. San Diego International Airport is also known as Lindbergh Field. The airport neighbors cities such as La Mesa, Santee, El Cajon, National City, Bonita, San Diego, Coronado, and Spring Valley cities in California. Other cities that are 17 miles from the airport include Lemon Grove, Chula Vista, La Presa, Imperial Beach, Bostonia and Rancho San Diego in California. Tijuana city in Mexico is also close to San Diego International Airport. SAN is the third busiest airport in the State of California and the 27th busiest airport in the United States of America. Maneuvering around the San Diego area can be hectic especially during peak hours. Finding a parking slot is also a tedious and draining task. All the more reason to embrace a cost-effective parking solution offered by TravelCar. TravelCar is a leading company in ride-sharing services and car rentals. We have the best team of professionals to get you to your desired destination in good time and in a comfortable way. The main services available at TravelCar include cost-effective parking solutions, listing vehicles for use by other travelers, and car rentals. At San Diego International Airport, TravelCar parking slots are located inside and outside of the airport and are easily accessible wherever you are coming from. Booking with TravelCar is made online on our website www.travelcar.com. It is a straightforward process, but in case you need help with that or need further clarifications; our customer service team is available 24/7 to cater to your needs. TravelCar offers cost-effective parking solutions in other busy airport hubs like George Bush International Airport, John F. Kennedy International Airport, Dallas/Fort Worth International Airport, San-Francisco International Airport, and Los Angeles International Airport. Other busy airports in the United States are Seattle-Tacoma International Airport, Hartsfield-Jackson Atlanta Airport, Phoenix Sky Harbor International Airport, Orlando International Airport, and Chicago O’Hare International Airport. The Santa Fe Depot train station serves Coaster Commuter trains and Amtrak Intercity trains. Below is a list of inns that you can visit near the airport. 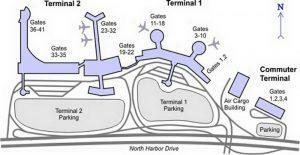 SAN has a total of 51 gates and two terminals. Terminal 1 (East and West) Gates total to 19 from A1, 1-18 Alaska Airlines and Southwest Airlines. Terminal 2 (East and West) The 32 gates are from number 20-51. The Eastern gates 20,21 and 22 host international arrivals. Air Canada Express, Spirit Airlines, Allegiant Air, American Airlines, British Airways, United Express, Edelweiss Air, American Eagle, Delta Airlines, Delta Connection, JetBlue Airways, Lufthansa, Air Canada Rouge, Japan Airlines, United Airlines, Hawaiian Airlines, WestJet, Sun Country Airlines, and Frontier Airlines. 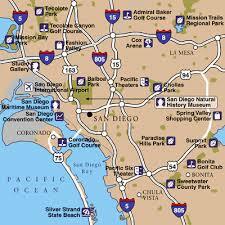 San Diego is a significant city along the Pacific Coast of South California. The city is awash with many tourist attraction sites. To explore all this beautiful place, you need a nice and convenient means of transport. A car rental will give you the freedom to reach areas that public transport means cannot. Moreover, you get all the privacy you require. TravelCar has, under its wings, a variety of automobiles that you can select from depending on the occasion or the number of people traveling with you. We have automatics, manuals, family vans, saloon cars, hybrid cars, and convertibles. Save money on insurance and other car maintenance costs by renting a car. You have an option of selecting a vehicle with low fuel consumption. Vehicles are insured so you need not worry about insurance. Our cost-effective parking solutions guarantee you a slot in the busy San Diego International Airport and the neighboring cities. For convenience purposes, a car rental accords you the aesthetic value that you require when attending essential functions such as business functions and family get-togethers. Moreover, if you are traveling with heavy luggage, it may be cumbersome using public transport. You can select the vehicle that will comfortably accommodate your luggage. TravelCar has a ride-sharing service that allows travelers to list their vehicles for use by other travelers. This is how it works: you submit your request on our website at www.travelcar.com, TravelCar agents will screen your documentation before approving, then finally when you are accepted, you can leave your vehicle at our parking lots. The cars will be leased out to other users, and you will earn from every mile covered. Once you return, you will be able to access your vehicle. Our parking lots are covered and secured with gates. We also have video surveillance on the premises. Guards are always on standby to keep vigil. Vehicles are washed and serviced to keep them fit for driving at all times. Parking prices at TravelCar parking slots are super affordable and flexible depending on the locality. All in all, if you compare parking rates by other companies in the San Diego area, you will find that we have the best parking rates in the region. We offer attractive discounts for early reservations on our website. Grab the offer while it lasts! Valet service is an additional service extended to a traveler in parking a traveler’s vehicle and bringing it back when needed. At TravelCar, our valet team is full of car experts that do a remarkable job in stack-parking and skillful maneuvering in the parking area. They save you the parking hassle at a reasonable fee and grant you extra time to tend to other pressing matters. Road Metropolitan Transit System Route 992 The bus runs from Downtown San Diego to the train station in San Diego International Airport. The bus also reaches Coaster, Pacific Surf-liner, and San Diego Trolley. Daily from 5:00 am to 11:30 pm. The bus leaves every 15 minutes on weekdays and after every 30 minutes on public holidays and weekends. Interstate 5 Northbound, Hawthorn Street Exit, North Harbor Drive, head on your right to terminal 1. Interstate 5 Southbound, Sassafras Street Exit, Kettner Boulevard, Pacific Highway, Laurel Street, North Harbor Drive and go on your right to the terminals. If you are driving from the cruise ship terminal, use West B Street, State Route 163 Southbound, I-5 Northbound, Hawthorn Street Exit, North Harbor Drive. Interstate-8, State Route 163 or I-5 Southbound. I-15, South State Route 163, I-8 Westbound. San Diego International Airport is keen on availing amenities usable by persons living with disabilities. Wheelchair services, TDD telephones, courtesy carts and visual paging monitors are available upon prior request. Volunteer Airport Ambassadors are present at various points in the airport to assist where necessary. Other facilities available at the airport include ATMs, Currency exchange firms, restaurants, restrooms and the USO lounge.